[Images: Borderville by Invertebrate; scanned from Issue #18 of Cabinet Magazine. 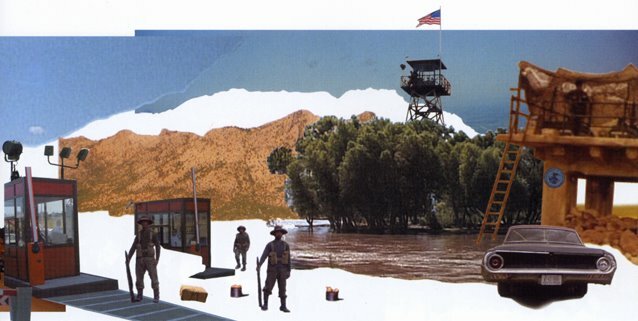 These were “assembled out of objects ripped from (…) movies featuring border crossings,” including Salvador, The Great Escape, Three Kings, Traffic, The Day of the Jackal, Not Without My Daughter, Bad Boys II, The Wild Bunch, From Dusk Till Dawn – etc. In other words, these are absolute borderlands, in-between spaces, a “backlash landscape” of political division. (Invertebrate: be in touch!)]. Great collages – thanks for scanning and sharing them.